Remarkably, Canadians have a worse impression of the Government of the United States than they do of the Government of the People’s Republic of China. 26% said they had a positive view of the Chinese government; 74% were negative. 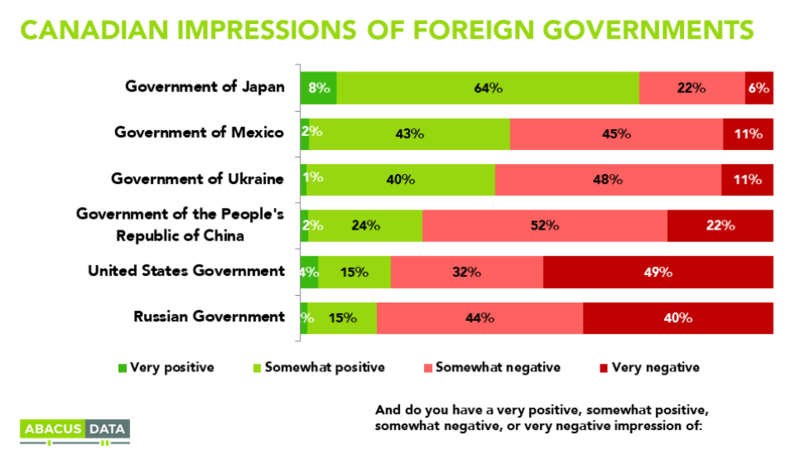 – Feelings about the Ukraine government are especially positive in Alberta (58%). – Women are 17-points less positive towards the Japanese government. – CPC voters were more likely (35%) than average to have a positive view of the US government, but still most (65%) have a negative view. As the country discusses the concept of free trade with China it may be worth noting that opinions about the Chinese government do not really differ among Conservative, Liberal, and New Democrat voters. Immigrants to Canada are quite a bit more likely to have a positive view of the Chinese government (40%) compared to those born in Canada (23%). According to Bruce Anderson: “Many American observers describe their current political situation in stark terms and call it unprecedented. While we haven’t measured exactly the same question in the past – it seems reasonable to assume that the current Canadian public view of the Trump administration marks a significant break with past attitudes. According to David Coletto: “The Trump era continues to confound. I can’t recall a time, at least in my life, when more Canadians would have had a more negative view of the US government than of the Russian government. Our survey was conducted online with 2,000 Canadians aged 18 and over from August 4 to 7, 2017. A random sample of panelists was invited to complete the survey from a large representative panel of over 500,000 Canadians. The Marketing Research and Intelligence Association policy limits statements about margins of sampling error for most online surveys. The margin of error for a comparable probability-based random sample of 2,000 is +/- 2.2%, 19 times out of 20. The data were weighted according to census data to ensure that the sample matched Canada’s population according to age, gender, educational attainment, and region. Totals may not add up to 100 due to rounding. We offer global research capacity with a strong focus on customer service, attention to detail and value-added insight. Our team combines the experience of our Chairman Bruce Anderson, one of Canada’s leading research executives for two decades, with the energy, creativity and research expertise of CEO David Coletto, Ph.D.